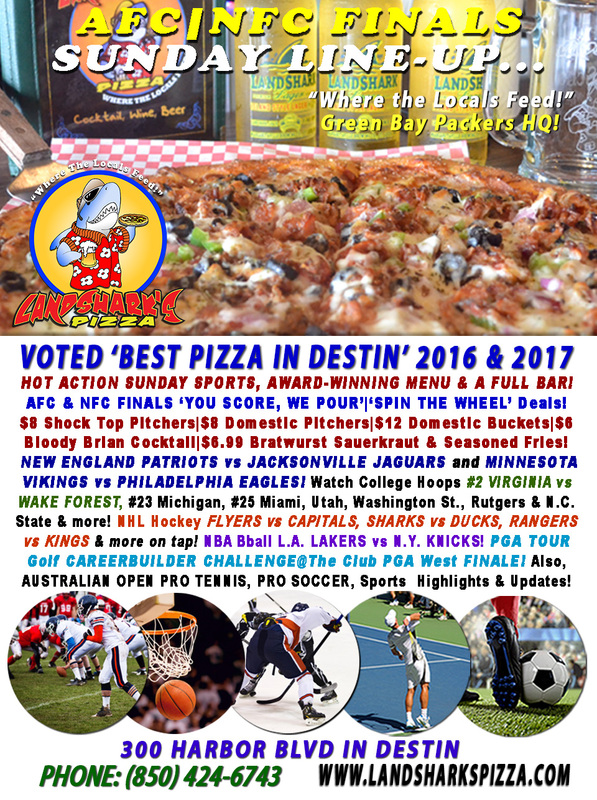 / Best Award Winning BBQ Destin FL / AFC|NFC CHAMPIONSHIPS Today! PATRIOTS vs JAGUARS|VIKINGS vs EAGLES|You Score, We Pour|$8 Pitchers & MORE! AFC|NFC CHAMPIONSHIPS Today! PATRIOTS vs JAGUARS|VIKINGS vs EAGLES|You Score, We Pour|$8 Pitchers & MORE! 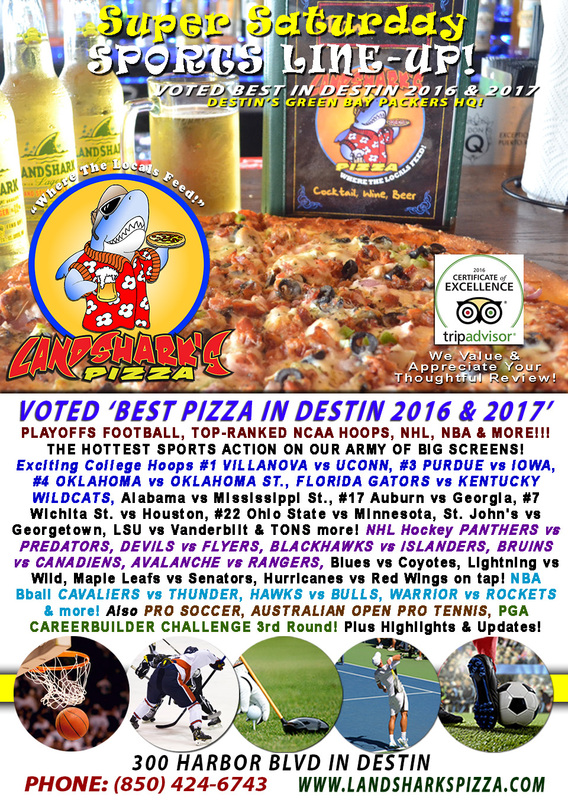 Get Ready To ROAR in Destin at Landshark’s Today with AWESOME Specials during the AFC & NFC Championship Games! MATCHUPS: $8 Shock Top Pitchers|$8 Domestic Pitchers|$12 Domestic Buckets|$6 Bloody Brian Cocktail! 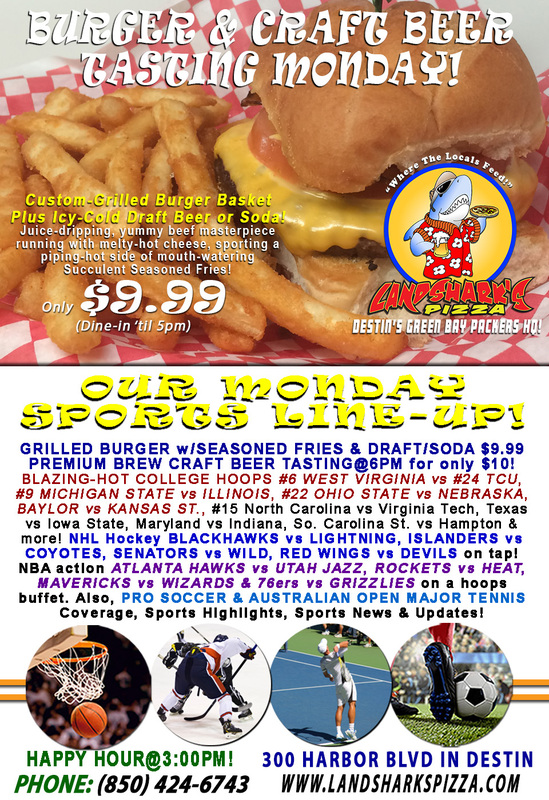 And that’s just the start of the action cuz we’ve got COLLEGE BASKETBALL, Hockey, PGA, NBA and plenty of GAME-TIME SPECIALS to keep you in the mood! Smokin’ Hot SPORTS ACTION On Our Army of Big Screens! AFC|NFC DIVISION Championship games NEW ENGLAND PATRIOTS vs JACKSONVILLE JAGUARS & MINNESOTA VIKINGS vs PHILADELPHIA EAGLES. College Hoops #2 VIRGINIA vs WAKE FOREST, #23 Michigan, #25 Miami, Utah, Washington St., Rutgers & N.C. State & more! NHL Hockey has FLYERS vs CAPITALS, SHARKS vs DUCKS, RANGERS vs KINGS & more on tap! Runnin’ & Gunnin’ NBA with L.A. LAKERS vs N.Y. KNICKS! PGA TOUR Golf CAREERBUILDER CHALLENGE@The Club PGA West FINALE! Also, PRO SOCCER & AUSTRALIAN OPEN PRO TENNIS, Sports News, Highlights & Analysis! Previous Post: « Super Saturday #1 VILLANOVA vs UCONN, Plus Crimson Tide|LSU|Duke|Auburn & MORE NCAA Action Pizza, Wings & FULL BAR!